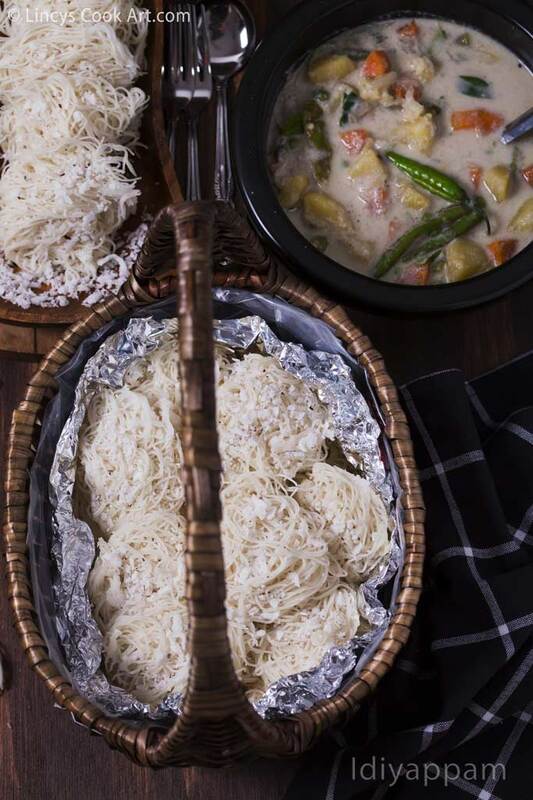 Idiyappam| Noolappam| Noolputtu| String Hoppers| Sevai are Indian style steamed rice noodles generally served with coconut milk based stew. These are soft noodles tastes awesome with stew or even with sugar and coconut milk. South Indians one of the comfort food generally prepared for breakfast. It is popular in South India -Tamil Nadu and Kerala and known in various names. You could prepare this idiyappam with home made roasted rice flour or even with store bought rice flour for idiyappam too. In our home we used to prepare stew and appam or idiyappam combination for Christmas and Easter breakfast. So would like to share this recipe for this Christmas! Boil 2 cups of water to rolling hot. While it is heating up in a deep bowl ad the rice flour with enough salt and mix once with spoon. Add the boiling water to the rice flour and mix with a ladle while it is hot. Once the mixture reaches bearable hot knead with hand without lumps into a dough. Keep the chillu (metal sieve like thing)inside the idiyappam press|maker. Once the dough cools down take some dough and fill the idiyappam maker and close with the lid. Grease your fingers with oil and apply on idli plates; Now press or rotate the idiyappam maker to release the idiyappam. While pressing rotate the idiyappam maker in a circular motion to overlap the strings. Using finger cut the string and repeat for the other plates. Now take a big pinch of coconut and keep on top of all the pressed idiyappam. Boil water till steaming hot and keep the idli plates with idiyappam and steam for about 10 minutes. Once done remove the idli plates and allow to cool and serve with Vegetable Stew, Chicken Stew..etc.